This article was published in Flare (Journal of the IBC) - May/June 2008, Volume 41, No. 6. 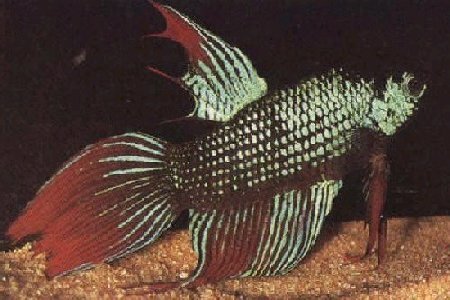 Copper and metallic colors have become immensely popular in our hobby and really have concurred the betta-world. But still there are many questions to be answered regarding these “new” colors. In this article I will try to give a bit more insight in these colors by covering how where they created, what causes this metallic color and how this color is inherited. 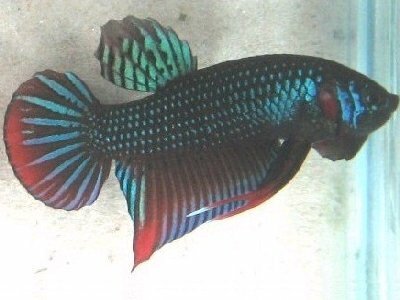 The metallic phenomenon was introduced in our hobby by outcrossing Betta splendens to wildtypes from the betta genus like betta imbellis, smaragdina and mahachai [1,2]. 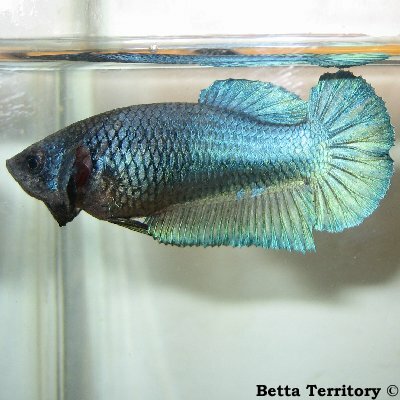 Betta imbellis, smaragdina and mahachai naturally have a higher degree of iridescence on the scales which probably is an adaption to the murkier water in their natural habitat . 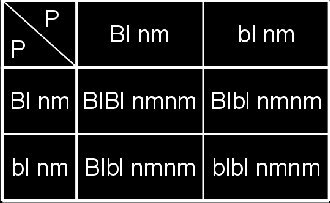 Because these wildtypes can be so easily intercrossed, many people have suggested that these fish are actually nothing more than geographical varieties of one species. Something which would be comparable to for instance the differences between people from Europe and a Asia, different looks but still once species. But was the principle of outcrossing to wildtypes something new in our hobby? The answer is to this question is no. These crosses are already a fixed practice for a long, long time in Asia. 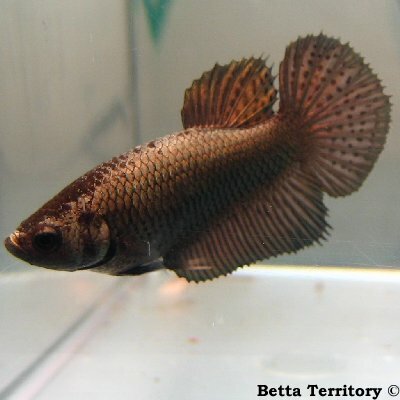 For ages the Thai have been trying to improve their bettas, mainly to create more complete fighter lines. 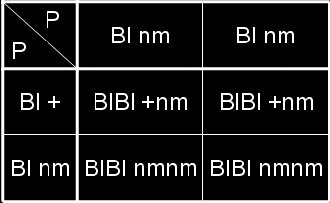 But the proof that these crosses were also known outside the fighter-community can be found in several well-known betta books. For example, the books of Walt Maurus (1981)  and Hans Gonella and Rajiv Massilamoni (1997)  both show a picture of a long-finned splendens x imbellis hybrid. 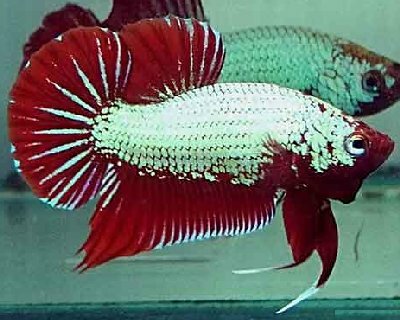 This logically brings us to the next question: as these hybrids are not new in our hobby, why did it take such a long time to develop the copper and metallic bettas as we know them today? 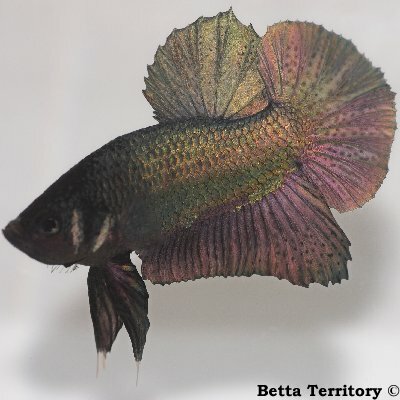 It is not easy to answer this question but probably the betta community earlier was not really interested or ready to breed these varieties and they did not recognize their potential. Around 2002-2003, the Asian breeders offered the first copper imbellis types on aquabid. These fish were created by selective breeding and stood at the base of the worldwide copper and metallic fever as we know it today. By outcrossing these fish to longfinned lines it did not take long untill the first copper imbellis deltas arose in the betta-scene. Outcrossing these fish to iridescent (turquoise, steel blue and royal blue) halfmoons produced the first metallic blues . The offspring of these types of crosses still contained a lot of red wash. Continuous selection for both color and finnage finally led to longfinned halfmoon metallics without red wash.
Outcrossing copper phenotypes to pure iridescent turquoise, steel blue and royal blue fish added another new trait into our hobby: the mask feature. 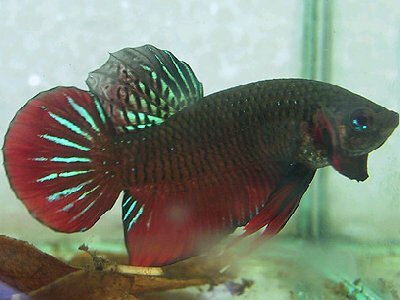 Normal iridescent bettas are characterized by their typical black heads. 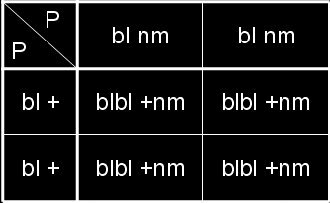 Outcrossing to copper bettas led to an increase color spread into the face and head area of the fish. 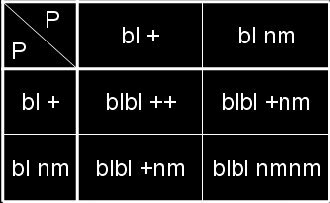 By now it is known that the metallic and mask trait are caused by seperate genes and can work independently. 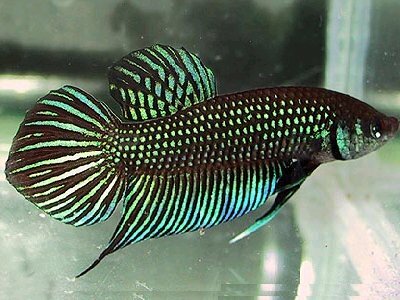 By selective breeding, it is possible to breed iridescent turquoise, steel blue and royal blue fish with mask features but also to breed metallics with solid black heads. Here it needs to be said that it is very difficult to get rid of the mask trait completely. Often partial masking and colored lips can be observed for many generations. What causes this metallic sheen on a structural level? 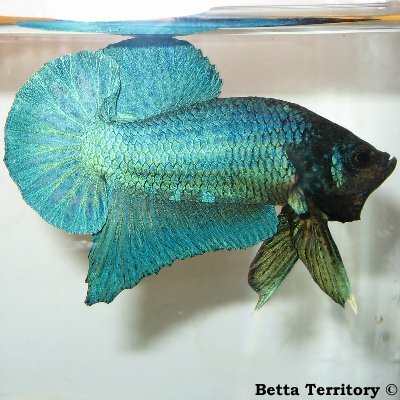 Most betta hobbyists are already familiar with the three iridescent colors: royal blue, turquoise and steel blue. 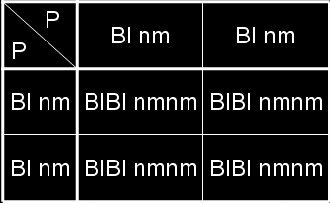 These colors are the result of the light reflection from thin (colorless) crystal elements which are present on the surface cells called iridophores [11,12]. 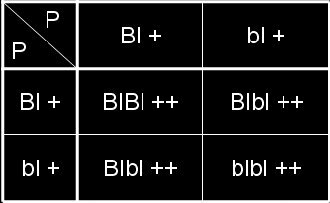 Such colors are often called structural colors, to distinguish them from colors produced by pigment (like red and black). 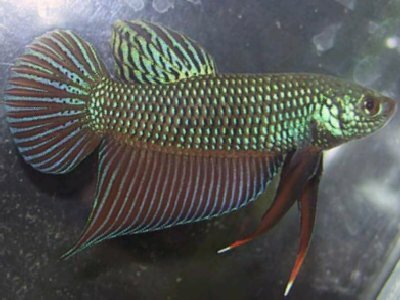 Recently Dr. Rosalyn Upson discovered that Betta imbellis as well as metallic and copper bettas contained iridiphores that reflected an entirely different part of the visible spectrum (yellow to yellow-green wavelengths) and therefore can be classified as a “new” yellow iridophore color . 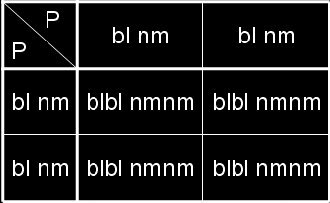 How is this metallic trait inherited? 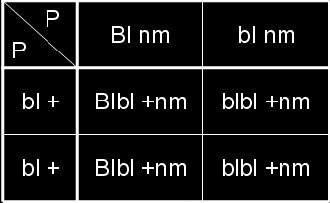 (1) Homozygous non-metallic (nm nm): Two copies of the 'non-metallic' gene. 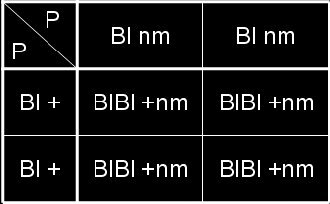 (2) Heterozygous metallic (+ nm): One copy of the metallic gene and one copy of the non-metallic gene. 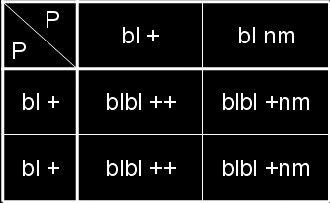 (3) Homozygous metallic (+ +): Two copies of the metallic gene. 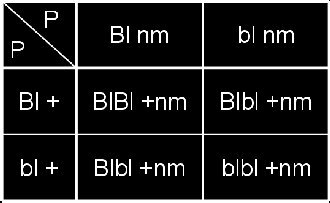 The fact that the wildtypes have the spread allele (+) indicates that the non-metallic (nm) allele must have evolved from the wildtype (+) gene during the centuries of domestication by selective breeding. 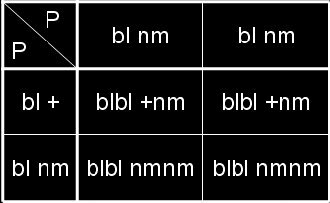 Dr. Leo Buss concluded that the metallic gene behaves as a single Mendelian dominant. 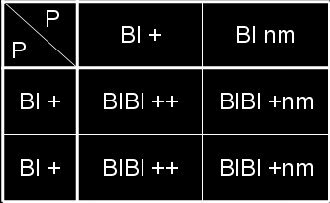 This means that when the only one copy of the gene is necessary to produce a metallic phenotype. 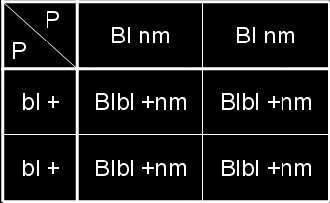 But one has to keep in mind here that it is not always easy to spot the metallic phenotype with the naked eye (macroscopic phenotype) in these cases a microscope (microscopic phenotype) is needed to provide additional information. 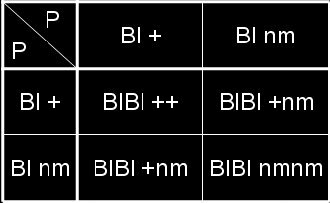 Below you can find several examples of Punnet squares in order to provide more insight in how the metallic trait is inherited by combining the relatively new metallic genetics with the more familiar blue genetics. 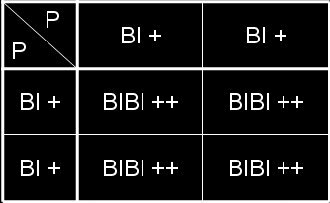 Please keep in mind that these genetic schemes are a theoretical approach and based on a combination of my own experience and several articles available. 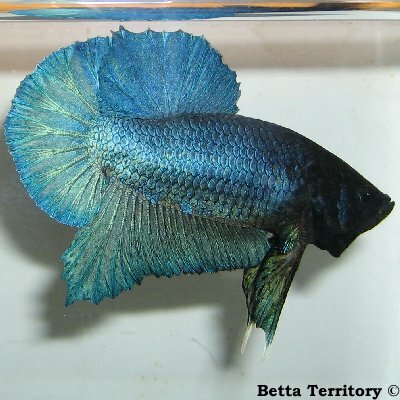 This article only focussed on the combination of (blue) iridescent color and the metallic trait but off course it did not stop here, crossing these metallics and coppers with other color variants of Betta splendens led to a huge amount of new color varieties. 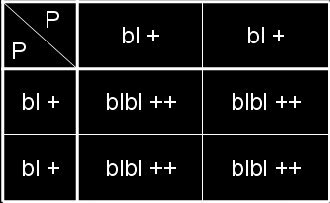 Crosses between opaque and copper for instance led to the development of the platinum whites and by now we have a huge range of metallic variations available like copper red, black coppers, yellow/golds, etc. 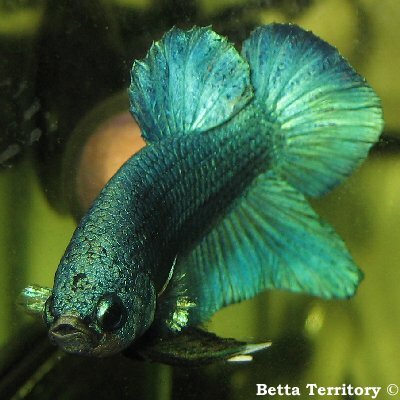 The lastest the development which stirred the metallic world of betta are the dragons! 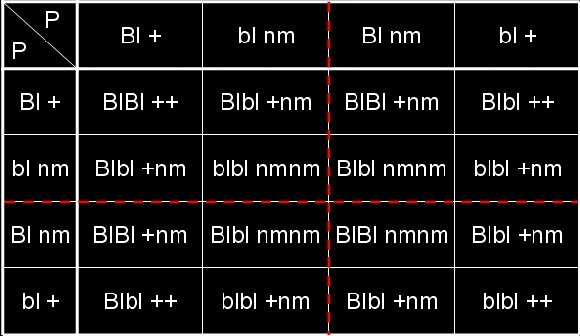 I hope this article gave a bit more insight and understanding on where the metallic trait originated from and how it is inherited. 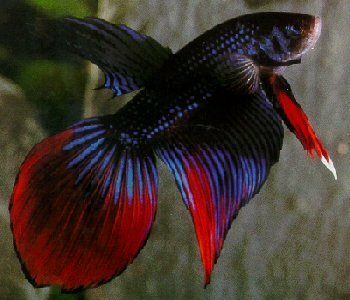 Welcome in the world of bling-bling bettas!! 1. Jintasaerewonge, Precha, "The story of Plakat Thai"
2. Jintasaerewonge, Precha, "A story of Betta smaragdina"
3. Parnell, Victoria, "Copper gold"
6. 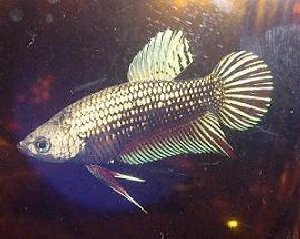 Panitvong, N, "Betta species Mahachai"
10.Parnell, Victoria, "Metallics and Masks"